The idea of S.M.A.R.T. goals has been around for a long time. Many of you who have attended management training have at one time or another been exposed to this concept. S.M.A.R.T. is an acronym for the elements that make up a well written goal. I’m advocating for a new acronym —S.M.A.R.T.E.R. This approach keeps the S.M.A.R.T. components and adds what I view as two critical elements. S = Specific. All goals should be focused on a specific outcome or behavior. M = Measurable. Effective goals can be measured. You define what success looks like. The measure can be quantitative (percentages, earnings, numbers) or qualitative (behavioral differences observed). A = Attainable or Achievable. Goals need to be seen as something that can actually be reached. Otherwise, they are just viewed as a pipe dream and have little impact on performance because nothing you do will ever be good enough. R = Relevant. They need to relate to what someone does and what someone has control over. If a goal really doesn’t relate to what I do, then why does it matter? T = Time bound. Too often, goals are set without a specific end date in mind. If a ‘goal’ is open-ended and ongoing, it’s not a goal. It’s a task or a process. E = Engaging. 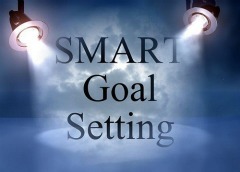 Goals are often thought to be very objective and numbers-driven, i.e., very intellectual, not emotional. Or, in the case of behavioral goals, sometimes people view them as not really that important. For people to take ownership of achieving a goal, they need to be emotionally engaged with the idea that achieving this goal is important to them, not just to the company or group. R = Recognized. People need to see that achieving the goal makes a difference. They need to see that something positive will result or something negative will cease. Recognition, rewards and reinforcement are all important for goals to be effective. Expectation Busters What is High Potential?